Posted in Associations, News, under Australasia. Tagged with Australia, Universities Australia. A bold new era of funding and evolution in modes of learning face Australia’s university sector, but the core purpose of education to elevate a nation and foster global education should not be forgotten. Australia also has a responsibility to deliver on internationalisation that must engender outbound study for Australians and a focus on the student experience inbound. "The latest trend for the best and brightest graduate trainees in India, is now micro courses or nano-learning"
These were among some of the clarion calls made at last week’s Universities Australia conference, which saw over 400 stakeholders from the country’s HE sector gather. The momentum around a sustainable, nimble and future-facing sector has already delivered results with the subsequent news that Christopher Pyne, education minister, announced research funding via NCRIS would be safeguarded from a 20% funding cut for another 12 months. “The government will be splitting the higher education reform bill in the senate, so that the reform, the deregulation … will be able to stand and fall on its own merit, separate from the reduction in the commonwealth grant scheme by 20%,” he announced. Funding of NCRIS had been attacked by some with Catherine Livingstone of the Business Council Australia calling it a “national shame” that its funding was a political hostage as the government’s higher education reform bill stalled without senate approval. Livingstone also addressed the conference to talk about the importance of embedding workplace learning into education, which chimed well with a new strategy from UA to make graduates more job ready announced at the conference in collaboration with various business groups including BCA. Should students all be taught coding in schools, Livingstone suggested, to ensure they can keep up with the digital economy? Should workplace learning begin at 16 so that graduates don’t fall into the “no experience” catch-22? Arizona State University’s President, Michael Crow, inspired many with his opening keynote about social inclusion in HE and its role to increase access. Other outstanding presentations included Professor Peter Shergold, Chair of the Higher Education Standards Panel, who spoke about a rapid shift in how people want to learn. 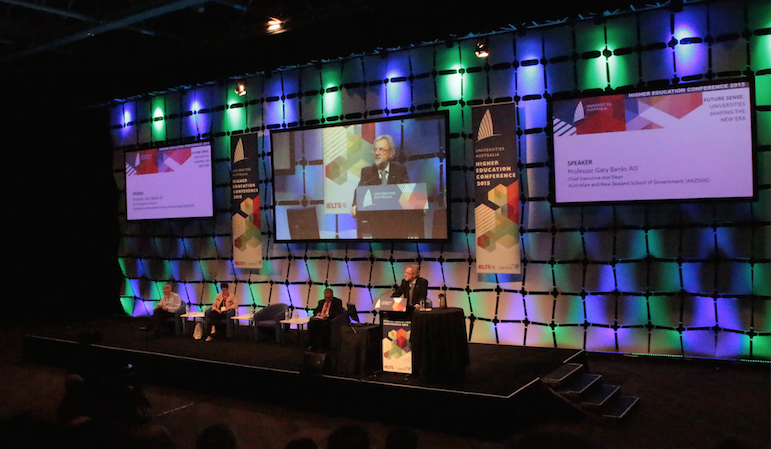 And sharing the plenary podium with Shergold was Professor Gary Banks, Chief Executive of ANZSOG, who asked difficult questions about how the international education agenda and desire to raise fees through greater volume of international students might impact on underlying quality of education delivered. His full speech can be read here. “Indications persist that many of those who do get enrolled are not up to scratch, including rumours and anecdotes of easy teaching and marking to ‘get them through’,” he challenged. A fascinating session about the government-funded Colombo plan saw Professor Kent Anderson from UWA challenge universities to push students to experience studying overseas via the OS-Help programme, which is under-utilised; something he called “morally reprehensible” (close to 15% of Australian students to go overseas). A new competitive market based around customisation, 24/7 student support and new metrics such as employability was discussed by Navitas, Deloitte Access Economics and the University of Queensland. Bruce Chapman, policy impact director at Canberra’s ANU – known as the “father of HECS”, the national student loan scheme – shared his thoughts on how fee deregulation may impact on international education priorities, should it become policy. He suggested that some universities may favour cutting back on “riskier” international recruitment if higher fees can be raised at home in a deregulated market. With a dinner hosted at Parliament House and shadow minister Kim Carr also addressing delegates, there was a political tension to discussions but also a universal agreement of the importance of universities in remaining at the cutting edge of education, research and social mobility.